I have to say, I'm in love with the new Hello Odds & Ends. The flowers, the hints of gold, the acetate pieces... SO MUCH FUN! I decided to start by featuring the Odds & Ends in a Box Card. 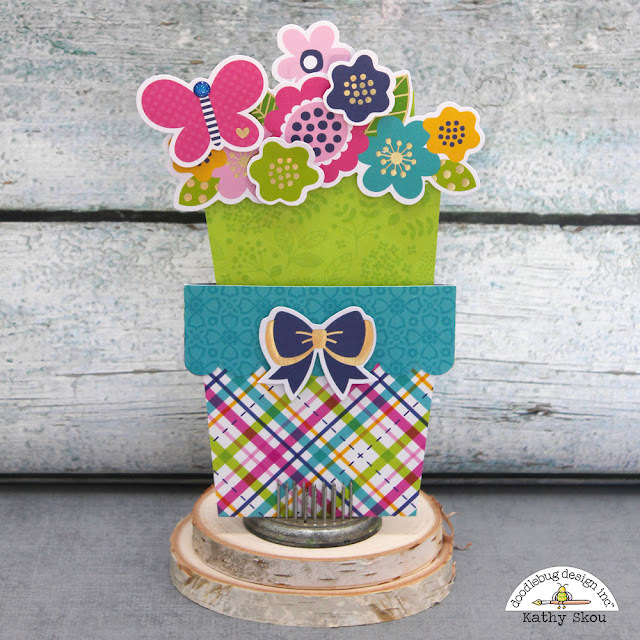 The body of the box card is made from the Beautiful Blooms Paper. 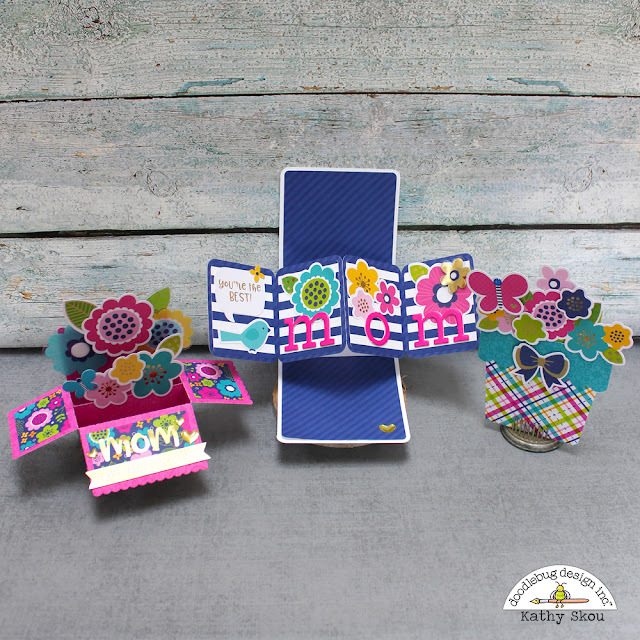 In addition to the Odds and Ends, I used a butterfly sticker from the Icons Sticker Sheet, a sentiment strip from the Chit Chat Pieces, the gorgeous new Heart of Gold Shaped Sprinkles and some Gold Abigail Font Stickers for mom. My next card is a Pop Twist type of card. I decorated the outside using the Navy Stripe Paper from the Hello 6x6 Pad, the Gold YOU and the hearts are from the Chit Chats, the love sticker from the This and That Sheet and some Beautiful Blossoms Shaped Sprinkles. And when you open the card, you get a big surprise! 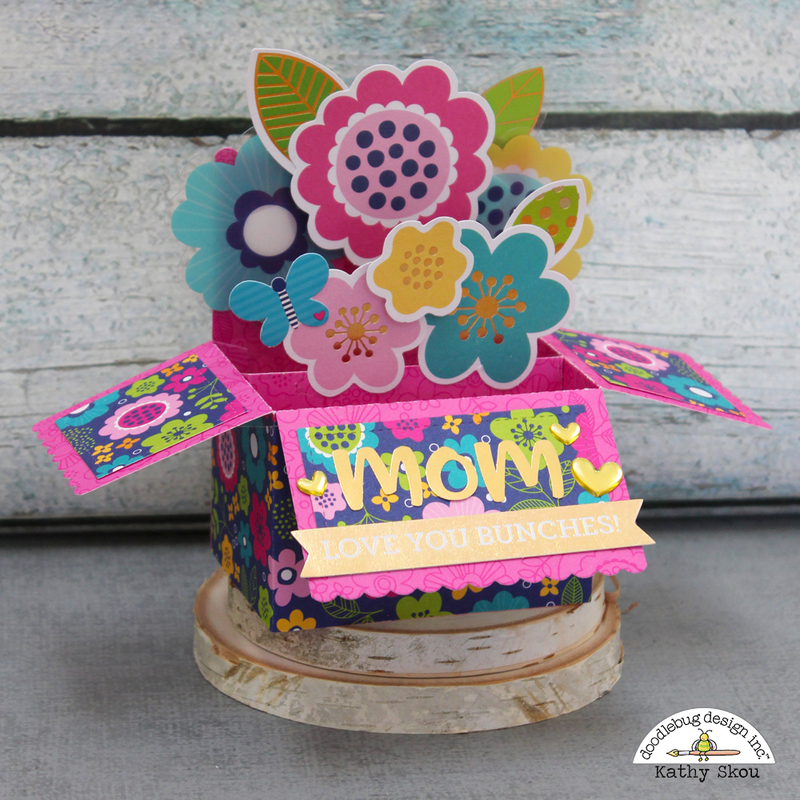 I embellished the inside with the bird and flowers from the Odds & Ends pack and the sentiment from the Chit Chat pack. The Cupcake Chippers coordinated perfectly! 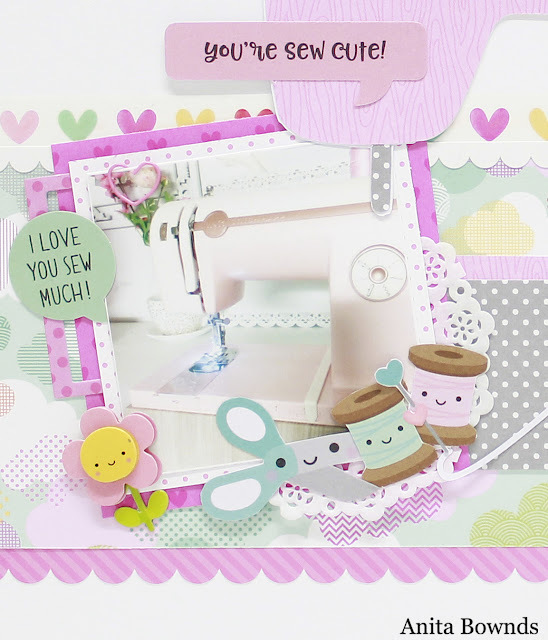 For my last card, I started with this cut file from Lori Whitlock. I changed it a bit so that I could add the Odds and Ends Flowers. I used the Hello There, Poppy Plaid and Lovely Papers for the pot, and then added the flowers, butterfly and bow from the Odds & Ends. 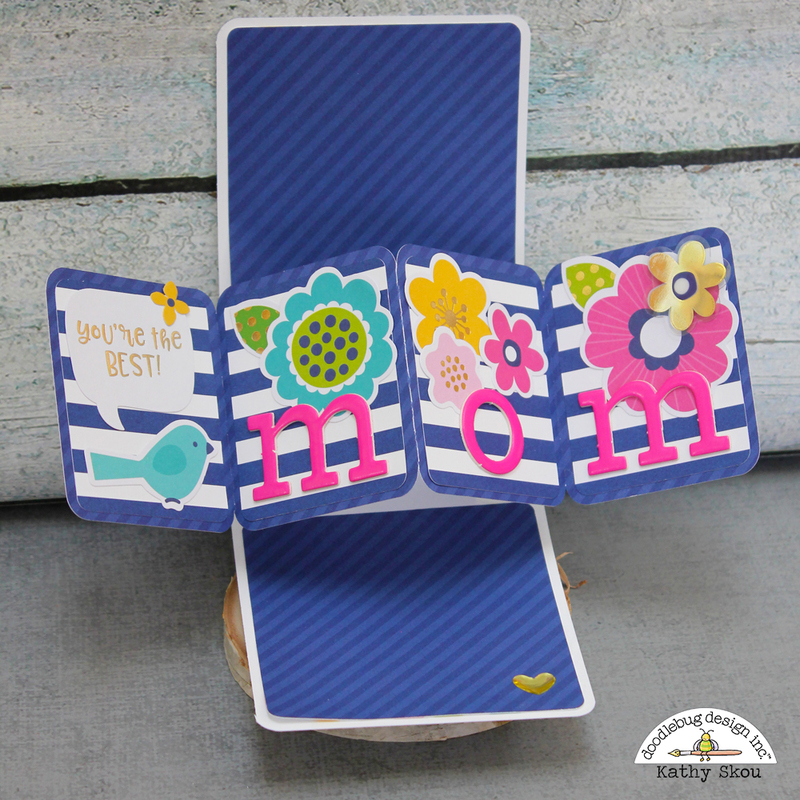 The top of the card pulls up, you could add a sentiment or even cut slots to hold a gift card for mom. Be sure to check the blog over the next couple of weeks for more Hello Mother's Day inspiration from the Design Team! That's it for me today, thanks for stopping by to peek! Do you struggle with the perfect amount of embellishments to add to your layout without making it look too busy and completely distract from your pictures? It's definitely a balancing act and with a few simple tricks you can certainly add some fun and interest to your page without being too heavy handed. 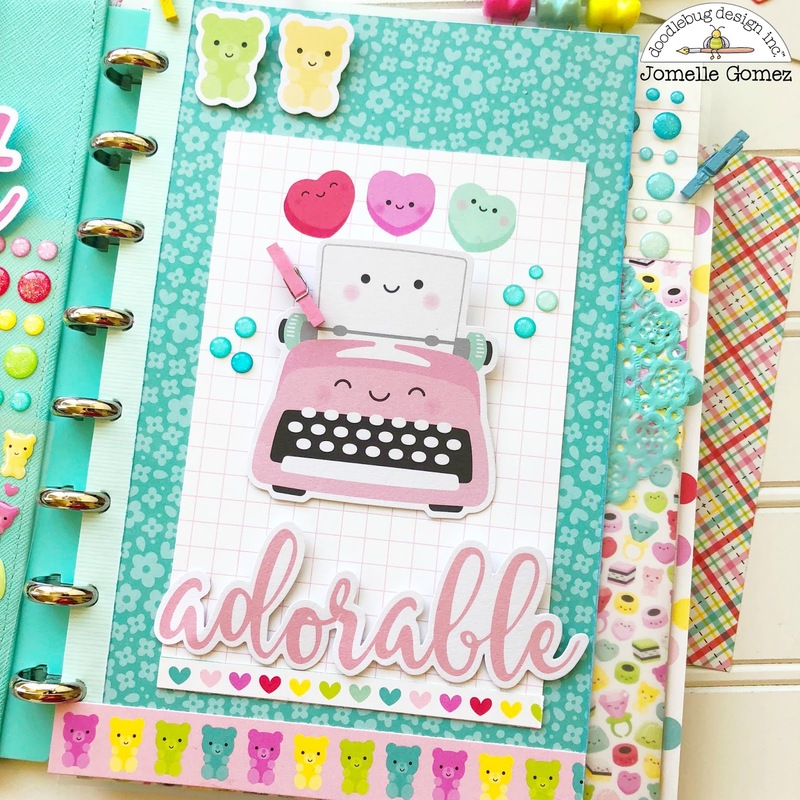 For a start, it's always an idea to keep the background paper relatively plain if you are going to add allot of embellishments to your layout. I've chosen the soft chicken wire paper as it's relatively plain without being stark white. However, I did add three more sheets of patterned paper behind the chicken wire as I wanted a bordered effect to my layout that acted as a frame. 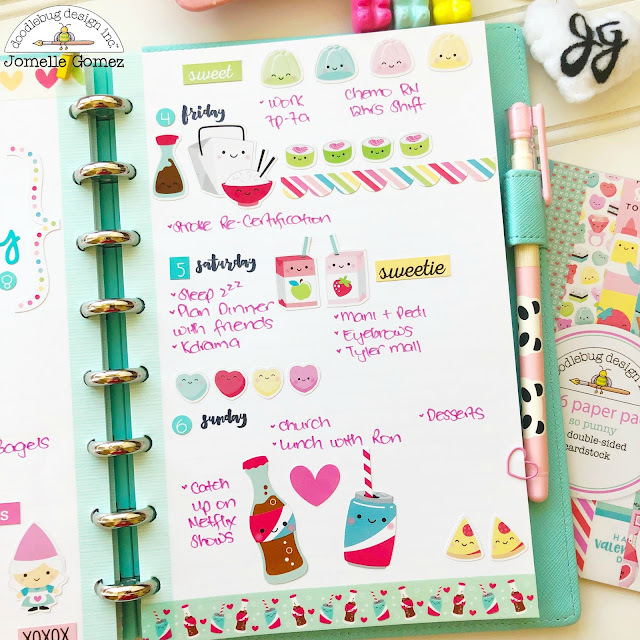 Apart from your photographs, journaling is the next most important thing on your layout as in years to come you won't remember the important details and dates of the photo. So, although it's important it doesn't need to be the first thing you see, which is why I printed my story on white card stock and used blue text to blend subtly into the background and allow the photo and heading to stand out with just a hint of added embellishments in the clouds, sun and little flies. 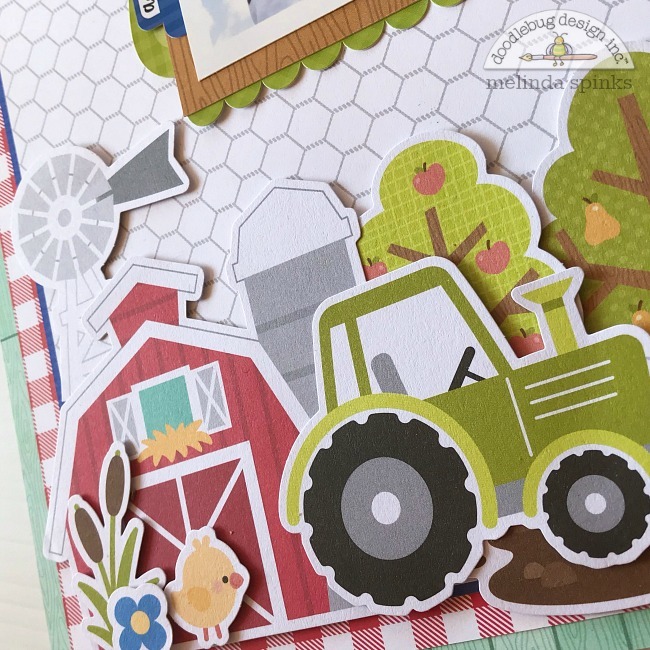 I've always loved creating scenes on my layouts and the Chit Chat Embellishment pack from the Down On The Farm collection had every single piece and more to make the cutest little farm scape across the bottom of my layout. Now, there's no way you would normally be able to use this many single embellishments on your layouts, however, by overlapping every piece and giving it dimension I was able to blend it into one single panel that ran across the bottom of the layout without looking too busy. 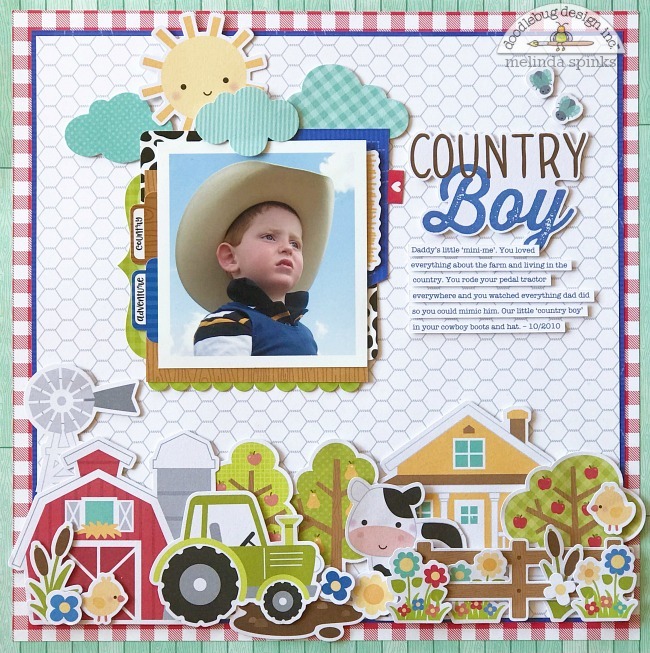 So from a glance the first thing your eye is drawn to is the photo and then it moves across to the journaling and then straight down to the farm scene at the bottom of the page which is the most aesthetic way to design your layouts. I usually draw a rough design before I begin and then work with my colors so that everything blends harmoniously. 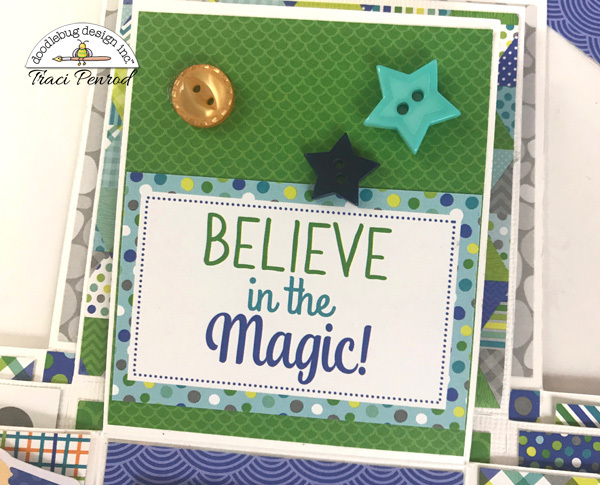 I hope I've given you some small tips to help you with your embellishing so you can add some fun to your next project in a way that's still pleasing to the eye and practical. What are you favorite embellishments? 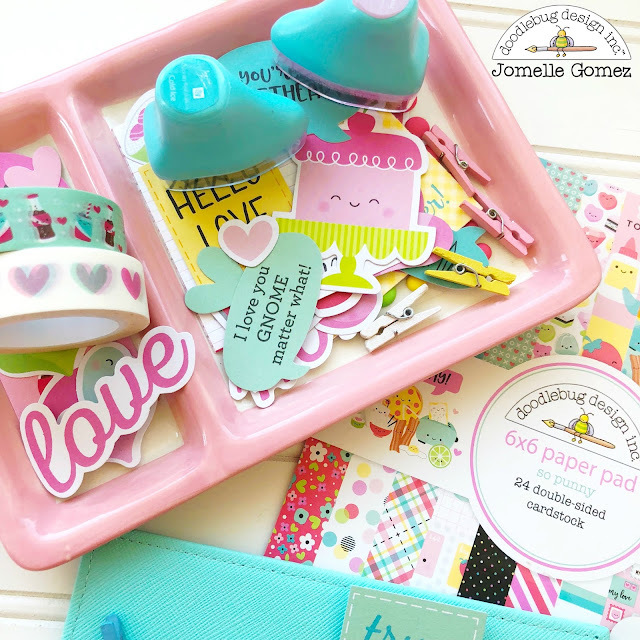 Doodlebug has variety of colorful and fun embellishments that I always love to use in my planner set up and layouts. 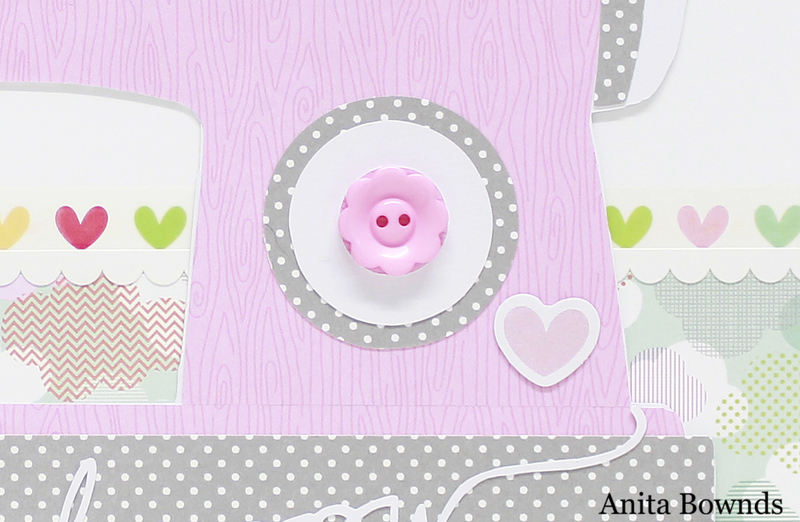 Embellishments are so fun and easy to use. They add that extra factor and detail in my planner. Did you know that Doodlebug has many, if not all the colors of doilies, sprinkles and mini clothespins? I love love using them. The odds & ends are perfect for decorating my planner pockets. As you may already know, I love decorating my planner pockets to match my dashboard. It's part of setting up my planner. I made my dashboard using pieces from the odds & ends. As you can see here, I added doilies, sprinkles and clothespins. Those small details just add the cuteness as part of the dashboard. 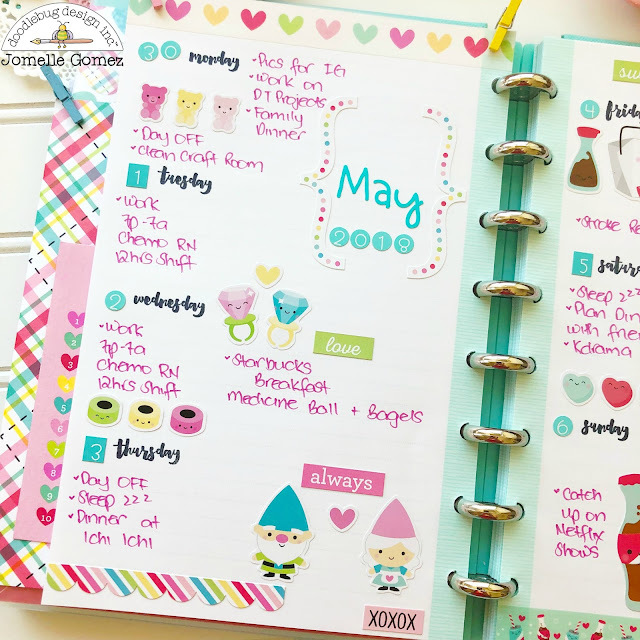 Weekly layout for the 1st week of May. I used the mini icon stickers to decorate my pages. 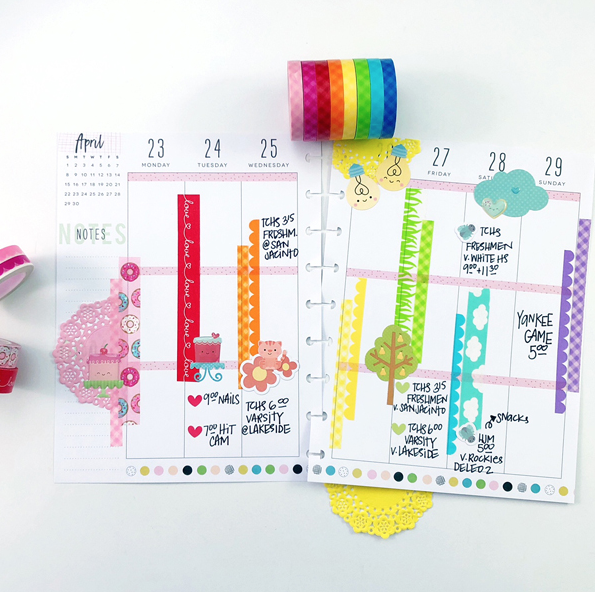 Doodlebug now has jelly clips that goes with each new collections and they are just perfect for my planner. I decorated one of the envelopes with some more odds & ends. I then added the heart clip and clothespins. I plan to use this to hold some sprinkles and I can just add holes to the side to put in my planner. 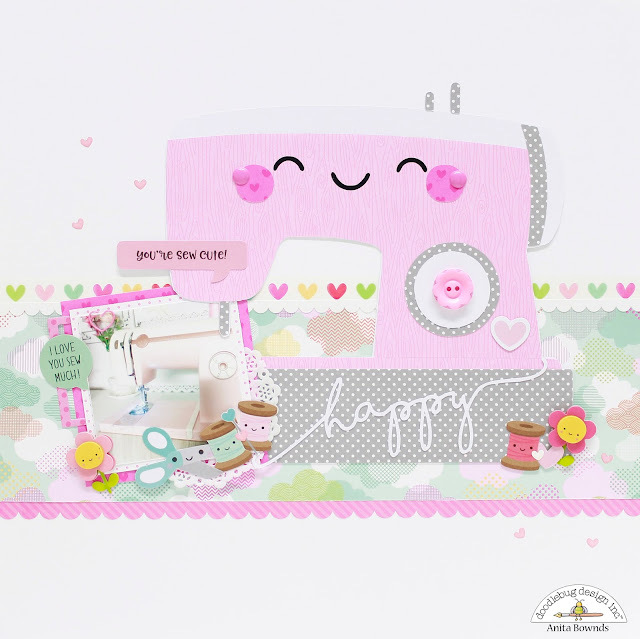 I just love all the embellishments Doodlebug has to offer. The colors and assortments will match any of their collections. 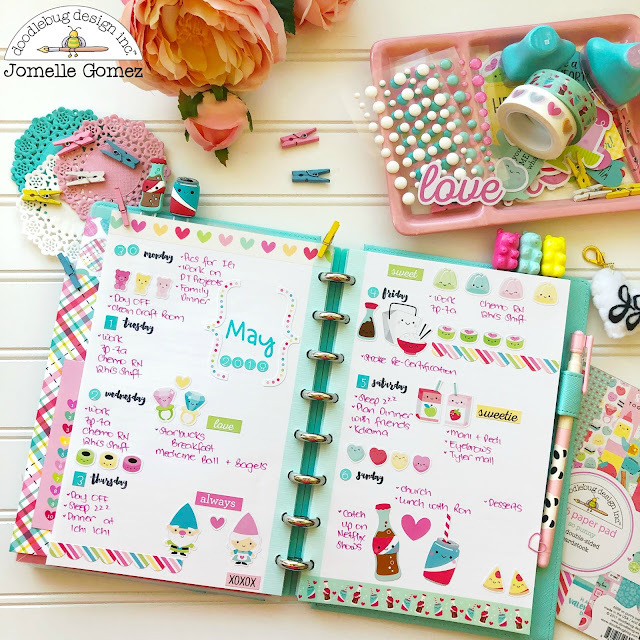 I hope you enjoy looking through my planner set up. See you next time. 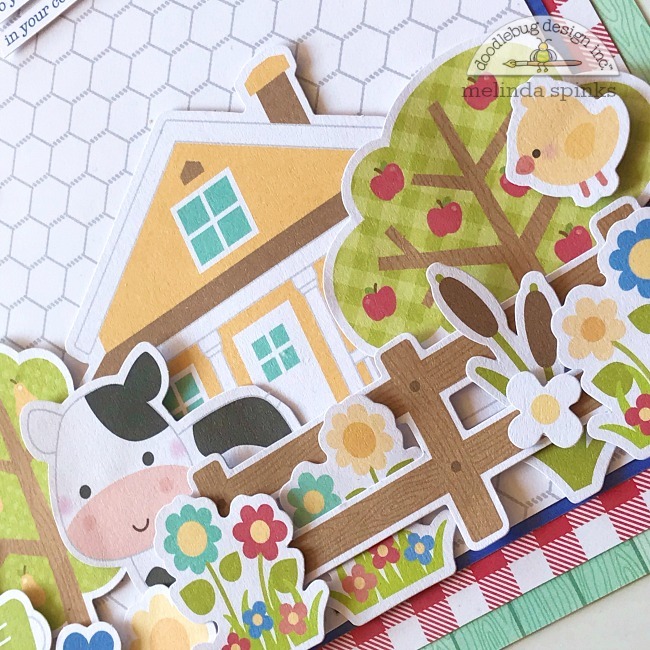 I just love how you can add a couple of strips of washi and a Doodlebug Down On The Farm Cardstock Icon Sticker or two and create something really amazing that can really inspire you throughout the week! 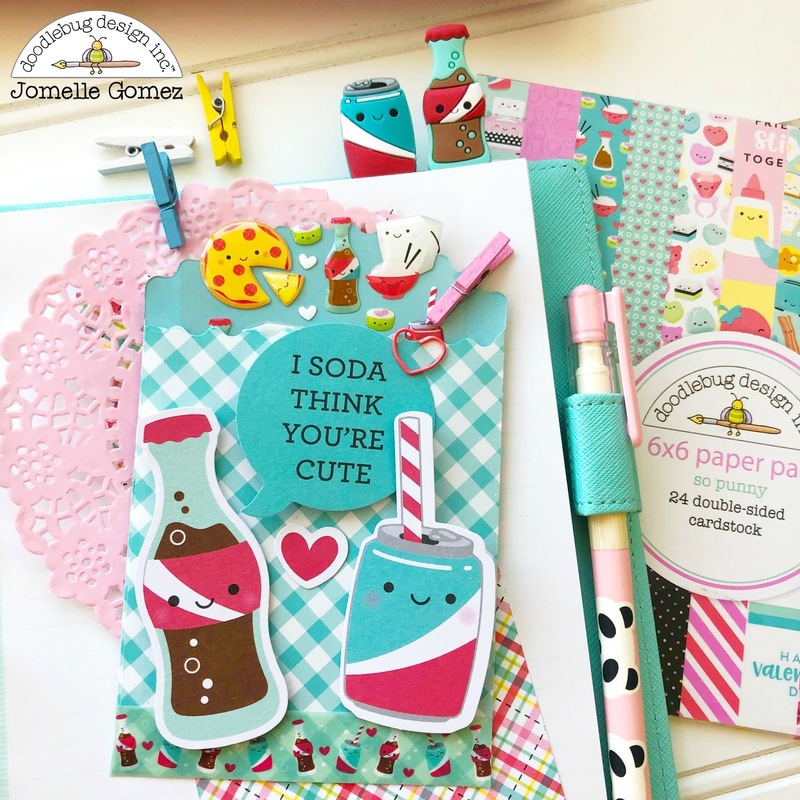 Do you love using Doodlebug Washi on your projects? Would love to know how you are using it? 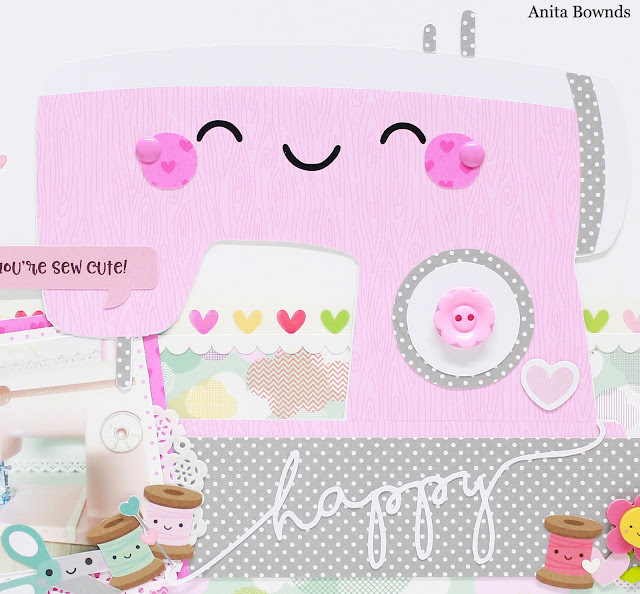 Today I’m sharing a layout with lots of little embellishments and all about my sewing machine. and what better way to do that with a sewing machine cut file from the so punny cut file Collection. 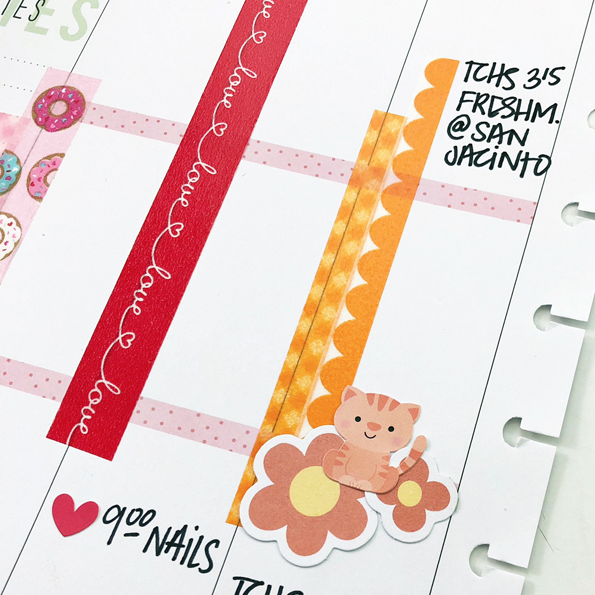 I added a strip of patterned paper 3 quarters down the cardstock and added some washi tape and a border sticker over the bottom of the washi tape. Next I add the sewing machine just off center so I had enough room to add my photo just underneath the needle of the machine so I looked as if I was sewing on it. Next I started adding some embellishments, button for the knob on the front, Sprinkles for the cheeks, little Chit Chat bubbles, tiny flower Doodle Pops and those cute little die cut sewing thread spools with a little pair of scissors. And then to finish off the layout I added more Tiny Heart Sprinkles. here is my process video on how I created my layout and sewing machine. When I first started using Doodlebug papers, I was always struck by how cute and polished the patterned papers were. Everything coordinated and it was so easy to pull a cute project together in minutes. And then I discovered the world of Doodlebug embellishments and the truth is that I have never looked back. 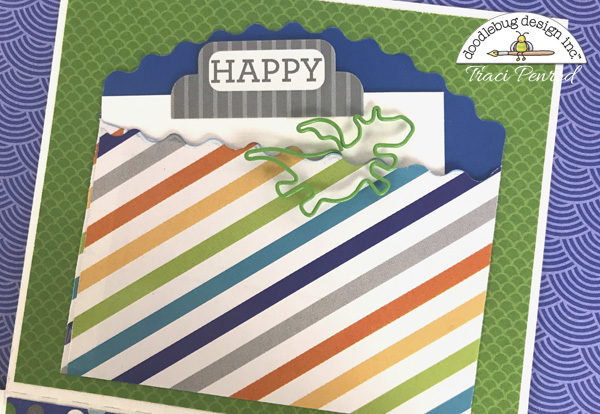 Almost all of my cards are made with Doodlebug papers and embellishments because, well - together they create something extra special. Let me show you what I mean. With Mother's Day and Father's Day coming down the pipe, I decided to get a head start on my cards using the great new collection called Down on the Farm. 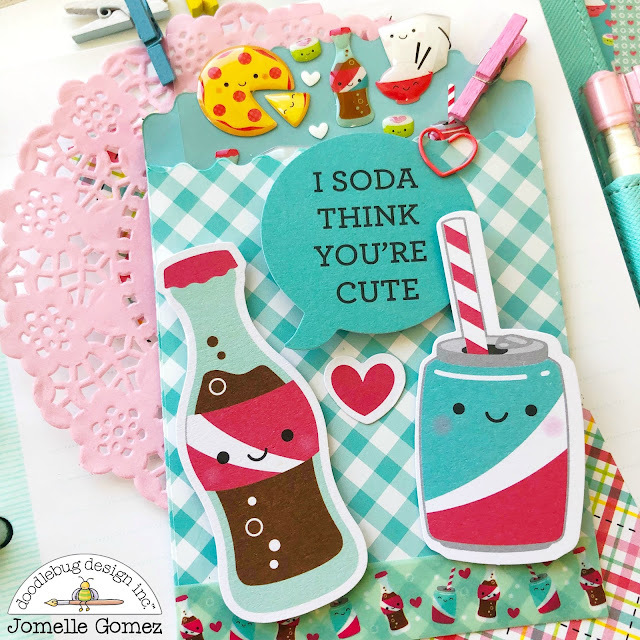 By pairing up a couple of cute die cuts from the Odds and Ends and Chit Chat collections together with some patterned paper, I was starting to lay out some cute little cards... ....like this once called "From All of Us Kids". Cute, right? But look what happens when I add just a few more embellishments - mini doilies, a few Sprinkles; and some mini paperclips. 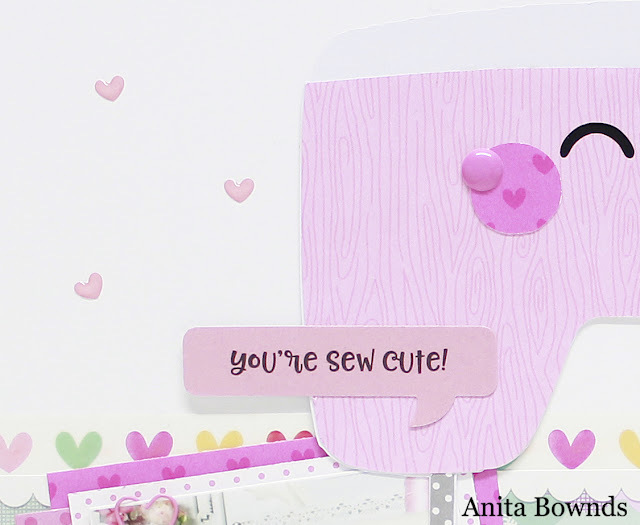 All of a sudden my card has gone from cute to cute AND polished! 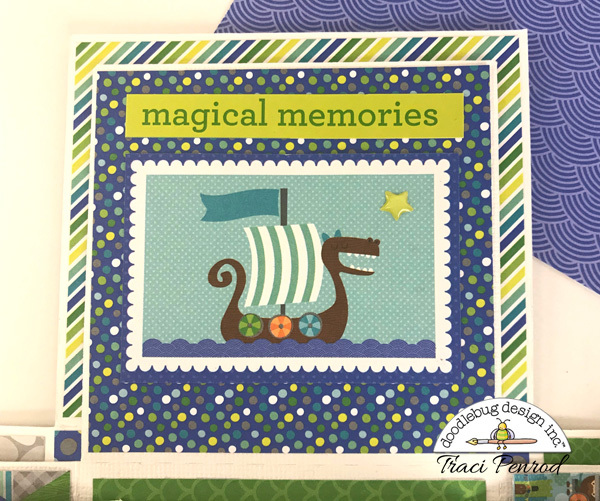 These are three products that make their way onto almost all of the cards I make. 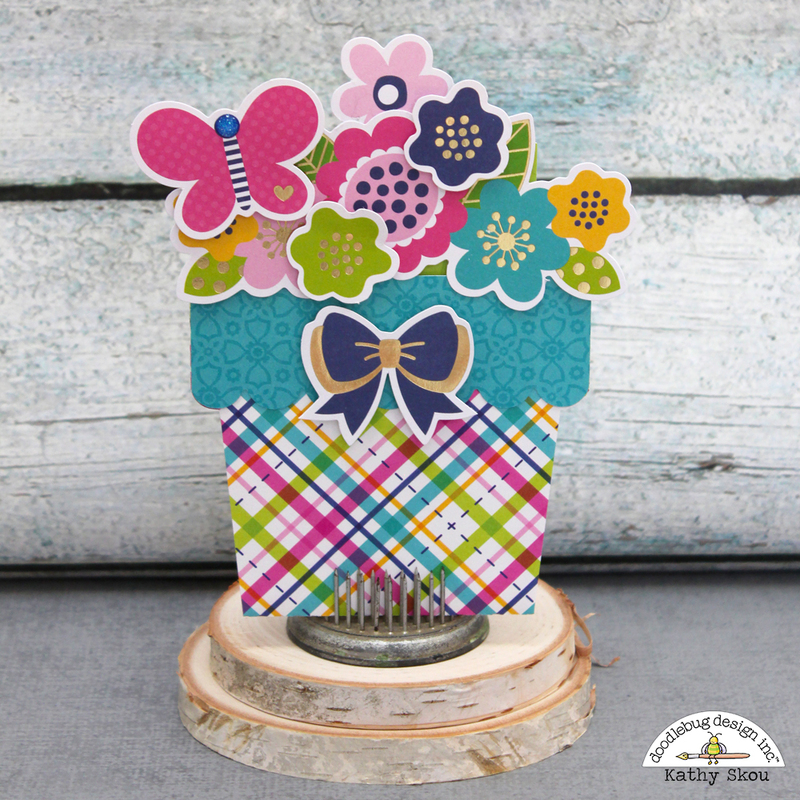 They add a punch of texture and I often use them to tie colours together across the card. 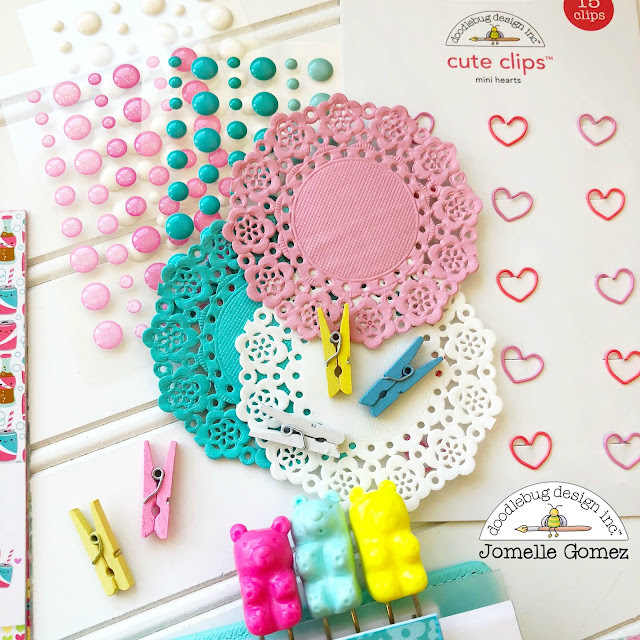 The mini doilies are the perfect size for standard A2 cards, and can be used to frame some cute die cuts or Doodlepops. 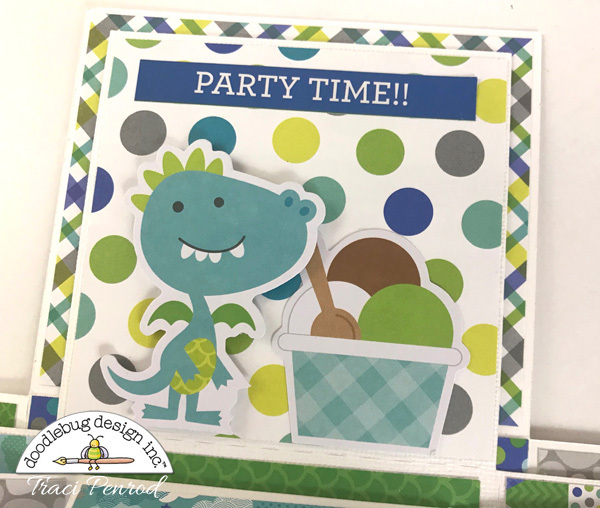 The Sprinkles; can be used to fill in some background space or to anchor a banner piece, and given that they come in so many sizes in a package, you can shake things up by mixing and matching or by choosing one size to work with on your project. And if you want something similar that is a bit more feminine looking, try the; Jewels for a sparklie embellishment. Oh, and don't forget the mini paperclips. Now look, if you know me at all, you will know that I am obsessed with stationary products, so these little cuties are right up my alley. But from a card-making perspective, I can always find just the right spot on the card to fill with a clip or two. 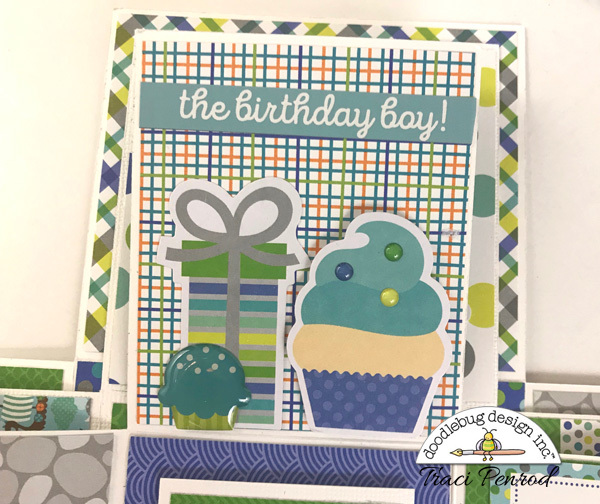 Like the Sprinkles, they add some great texture and a pop of colour right where you need it, without taking away from the cute images that are the focus of the card. And by using these three embellishments in different ways, you can have a whole set of cards that are pulled together but totally unique! I dare you to find one of my Doodlebug projects that doesn't feature at least two of these cute embellishments. They really are part of my card-making toolkit. And if they are not a part of yours yet, I dare you try them out and see if, like me, you never look back! If you are in the mood to play with lots of embellishments, an explosion box is a great project! 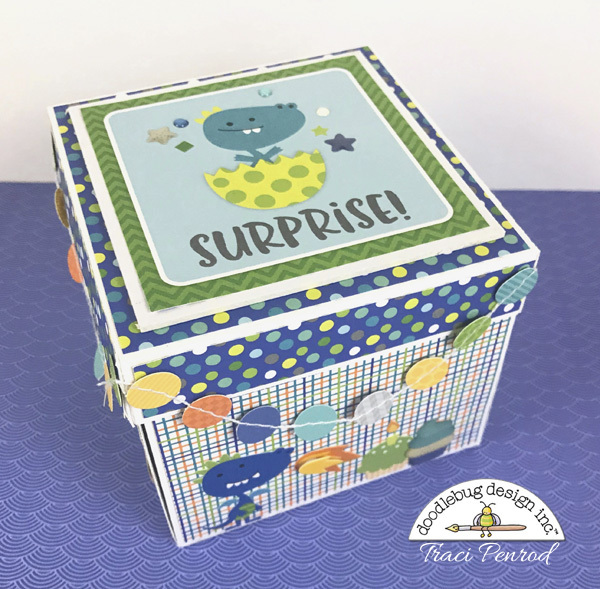 This cute box will make such a great gift ... and it's so much fun to make! Not only is the box itself a unique gift, but you can tuck another small present down inside. Once you remove the lid, the box folds open to reveal lots of layers and cute embellishments. I also plan to add photos on some of the blank pages. 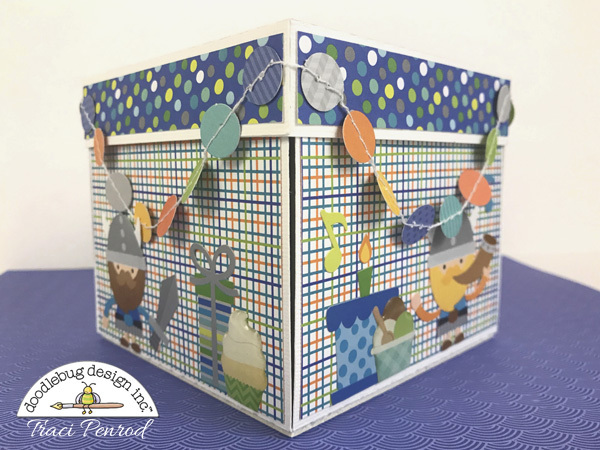 For the outside of the box, I added pattern paper and stickers from the adorable Dragon Tails collection. The Odds & Ends were perfect for these pages ... just the right size! Is that little dragon clip not the cutest? He's hanging out on the edge of a treat bag that I cut down and re-glued to fit my small page. What would a mini album be without a few adorable boutique buttons? I finished up the box by hanging some mini garland around the lid. 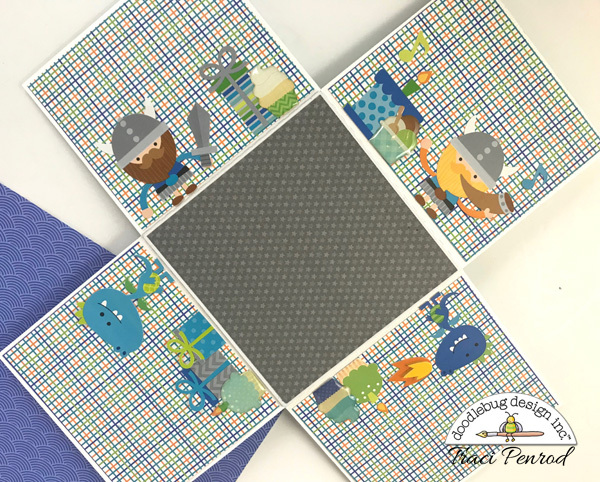 Here is a link to the Explosion Box cutting file I used for the base layers (I cut all of the pattern paper by hand) and a similar cutting file by Lori Whitlock. Have fun with this project!